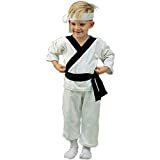 Aeromax - Jr. Astronaut Suit With Cap (Toddler/Little Kids/Big Kids) (White) - Apparel An astronaut suit so official looking you might just gain clearance onto a NASA space shuttle. Black padded collar. Full zipper closure and a rear elastic waistband. Faux buckled suspenders and belt. Fitted sleeve cuffs and ankles. Official NASA, commander, American flag patches. Four zipper pockets along the legs. Snap button pocket on the left sleeve. Embroidered NASA cap. Aeromax - Jr. Astronaut Suit with Cap (Toddler/Little Kids/Big Kids) (Orange) - Apparel An astronaut suit so official looking you might just gain clearance onto a NASA space shuttle. Black padded collar. Full zipper closure and a rear elastic waistband. Faux buckled suspenders and belt. Fitted sleeve cuffs and ankles. Official NASA, commander, American flag patches. Four zipper pockets along the legs. Snap button pocket on the left sleeve. Embroidered NASA cap. Aeromax - Jr. Cowboy with Hat (Toddler/Little Kids/Big Kids) (Brown) - Apparel Saddle up and tame the Wild West, sheriff. Dual color three button suede-like vest. Cowboy chaps remain in place with a rugged belt and a hook-and-loop closure. Realistic hat. Dual color rugged gloves. Paisley handkerchief. Aeromax - Jr. Magician With Top Hat (Toddler/Little Kids) (Black) - Apparel Show them you have all kinds of tricks up your sleeves with the Aeromax Jr. Magician With Top Hat accessory kit. Top hat. Magic wand. Button down vest with adjustable strap at back. White gloves for easy sleight-of-hand. Cape with secret pockets and hook-and-loop closure. Aeromax - Jr. Armed Forces Pilot with Helmet (Toddler/Little Kids/Big Kids) (Army Green) - Apparel Secure the American skies from high altitudes and at zero gravity. Official Air Force one piece pilot suit with zipper closure. Elastic waist. Armed Forces patches. Various zipper pockets along the arms, chest, and legs. Black and yellow fabric strip along the legs. Zippers extend the leg openings. Helmet with retractable tinted shield. Aeromax - Jr. Executive Chef Suit with Hat (Toddler/Little Kids/Big Kids) (White) - Apparel Create delicious cookies and yummy cakes alongside mom in this cr me de la cr me Jr. Executive Chef Suit with Hat. Double breasted executive chef s coat. Embroidered Monsieur Chef on both coat and hat. Three front pockets. Realistic chef elastic waistband pant. Tall chef s hat. Quilt pattern mitten. Aeromax - Jr. Explorer with Cap (Toddler/Little Kids/Big Kids) (Brown) - Apparel True explorers relish the sound of roaring lions and the chattering of chimpanzees as they survey uncharted territories. Single piece suit with tortoise shell button closure top and hook-and-loop closure bottom. Elasticized waistband shorts. Adjustable belt. Explorer inspired and American flag patches. Collar features tool screenprints. Rear T-Rex screenprint. Cargo button pockets. T-Rex screenprint safari hat with an adjustable chin strap. Aeromax - Jr. Police Suit with Hat (Toddler/Little Kids/Big Kids) (Blue) - Apparel Aeromax Costumes provides you all the necessary equipment to tame the urban jungle and protect its fine citizens. Long sleeve uniform shirt. Polished button front closure. Each sleeve is proudly decorated with police force patches. Stretch waistband pant follows his every move. Standard issue accessories: police officer hat, handcuffs with keys, utility belt, walkie talkie, whistle, police badge, nightstick, and attachable police shield. Aeromax - Jr. Champion Racing Suit with Cap (Toddler/Little Kids/Big Kids) (Black) - Apparel Experience the thrills of hugging the turns and seeing the white flag wave. Full length zipper and elastic waist one piece racing suit. Hook-and-loop embroidered neck and ankle straps. Unique racing embroidery, patches, and screenprints. Aeromax Racing Team logo across the back. Silky Champion Racing panel along the legs. Knee and elbow patches. Vibrant piping. Embroidered Champion Racing adjustable cap. Aeromax - Jr. Physician with Lab Coat (Toddler) (Blue) - Apparel Thoroughly prep for surgery with the Jr. Physician with Lab Coat costume. Single pocket on the lab coat can hold thermometers and pens. Embroidered Rod of Caduceus. Matching short sleeve scrub top and pant. Stay sterile with the hat, face mask, and shoe covers. Aeromax - Jr. Camo Suit with Cap (Toddler/Little Kids/Big Kids) (Camo) - Apparel Answer the call of duty and prepare to defend your freedom and your toys from your grubby sister s hands. Single piece camouflage uniform is lightweight enough to wear over warmer clothing or solo during hotter missions. Two chest flap pockets. Top buttons with matching camo buttons. Stretch waist. Matching belt for either a soldier uniform or civilian attire. Two side flap pockets on the pant. Drawstrings cinch tightly around the ankles. Sturdy matching cap. Aeromax - Jr. Train Engineer With Cap (Toddler/Little Kids) (Stripe) - Apparel Watch the green countryside rush past as you guide your train in your brand new quality Jr. Train Engineer costume. Bib overall with a center, two side and rear patch pockets. Adjustable overall has an old time look with black and white stripes. Complete the authentic look with the red paisley bandana, and NWT Certified adjustable engineer s hat and quality leather gloves. Puppet Workshop - Swirl Mod Wear Dress (Toddler/Little Kids/Big Kids) (Multi) - Apparel Pose for the flashing paparazzi in this dazzling diva s dress. Off the shoulder dress is simply fabulous with a swirl and sparkle print. Keyhole collar shines with a multicolored sequin trim. Swirling pattern marabou gloves cover diva arms from the wrist up to past the elbow. Silver flicked chandelle trims the hemline. Made in USA. 100% polyester. Hand wash cold, line dry. Puppet Workshop - Daisy Mod Dress (Toddler/Little Kids/Big Kids) (Orange) - Apparel Peace and love are all a flower child needs to bloom. Brilliant foil mod dress wows with shining sparkles scattered among a daisy design. Silky daisies adorn at the waist of the net and foil skirt. Fascinating angel sleeves. Matching sash is eye catching worn either as a headband or scarf. Made in USA. Puppet Workshop - Daisy Mod Set (Toddler/Little Kids/Big Kids) (Orange) - Apparel Shimmer like crazy with this fun foil daisy outfit. Sassy foil crop top is fresh with strip of netting around the shoulders, bell sleeves, and vibrant daisies. Foil pants have a stretch waist for a comfy fit. Made in USA. Both 100% polyester. Hand wash cold, line dry. Jr. Armed Forces Pilot Suit Toddler Costume Includes jumpsuit and cap. Shoes not included. Jr. Train Engineer Suit Child Costume Includes: Overalls, bandana, cap and gloves. Shoes not included. Jr. Fire Fighter Suit Tan Toddler Costume Includes: Overalls, coat, and cap. Shoes not included. Jr. Astronaut Suit White Toddler Costume Includes: Jumpsuit, cap. Shoes not included. Jr. Astronaut Suit Orange Toddler Costume Includes: Jumpsuit, cap. Shoes not included. Available in Toddler Size: 18 months. Jr. Police Officer Suit Toddler Costume Includes: Shirt, pants and cap. Shoes not included. Fire Captain Blaze Toddler Costume Includes muscle jumpsuit and hat. Shoes not included. Available in toddler sizes 2T and 3T-4T. Fire Truck Toddler A fun costume for a future fire fighter! Includes: Soft foam fire truck with adjustable shoulder straps and fire chief hat. Available in one size, Toddler up to 4T. The manufacturer suggests stuffing the nose of the fire truck with paper towels for a fuller look. Mamas, let your babies pretend to be cowboys! The Lil’ Cowboy costume includes blue pants with attached chaps, a red and white gingham top with blue lapels, brown fringe and star appliqués, and an over-sized red cowboy hat with brown band and gold star detailing. Belt/Holster with two toy guns is also included. Available in Toddler Size – 2-4T. Navy Uniform Toddler Costume Includes shirt, pants, and hat. Shoes not included. Available in Toddler size 2T-4T. Marines Uniform Toddler Costume Includes shirt, hat, and pants. Shoes not included. Available in Toddler sizes 2T-4T. Police Motorcycle Toddler A totally unique costume! Includes a soft helmet style hat, a padded 3-D motorcycle with adjustable supenders to support the weight of the costume, hold the costume around the waist, and give the illusion of riding on the motorcycle. One size fits most toddlers up to a size 4T. Army Uniform Toddler Includes shirt, pants, and hat. Shoes and sunglasses not included. Available in Toddler size 2T-4T. Air Force Uniform Toddler Includes flight suit and cap. Shoes not included. Available in Toddler size 2T-4T. The Jolly Green Giant's sidekick! Best friend and mischievous co-spokesperson to the Jolly Green Giant®, this costume includes a stem hat with leaf accents, lighter green pants and long-sleeved shirt with partial turtleneck and dark green leaf tunic. ©2006 General Mills, Inc. This is an officially licensed Sprout® costume! Available in Toddler size 2-4T only. Baby Fifties Costume - Child 50s Costumes The Baby Fifties Bandstand Costume includes black leotard, skirt with poodle, scarf, and belt. Hansel Toddler - Fairytale Classics Includes pants with attached suspenders, shirt, and gingerbread candy bag. Available in Toddler size 2-4T. Boots and socks not included. Here comes the choo-choo train! Includes: Soft foam train engine with adjustable shoulder straps and train engineer style hat. Available in one size, Toddler up to 4T. Perfect for your little up-and-coming Annie! The Lil’ Texy costume includes a blue skirt with brown fringe, a red and white gingham top with blue lapels, brown fringe and star appliqués, and an over-sized red cowboy hat with brown band and gold star detailing. Belt/Holster with two toy guns is also included. Available in Toddler Size – 2-4T. Indian Boy Infant/Toddler Going native is the way to go. Having a little pow wow about what costume to get for your child this year? The Indian Boy costume is great choice. The costume includes: fringed beige shirt, pants with tabbard , and headband with feather. Available in Infant size 12-18 Months and Toddler size 2-4T. Indian Girl Infant/Toddler Become a native daughter. Having a little pow wow about what costume to get for your child this year? The Indian Girl costume is great choice. The costume includes: dress with fring and headband with feather. Available in Infant size 12-18 Months and Toddler size 2-4T. Fire Chief Toddler Look who wants to put out fires! Includes fabric fire chief jacket with self-lock tabs closure, plastic fire chief helmet and matching boot tops. Availabe in Toddler size Large (3T-4T). Lil Patty Cake Baker Toddler Includes dress, apron, scarf, and hat. Tights and shoes not included. Available in toddler sizes: 24 Months to 2T and 3T-4T. Astronaut Toddler Three-Two-One Lift Off!! One giant leap for kidkind......The Astronaut Costume includes an orange jumpsuit with authentic clips, straps, patches, and cap. Shoes not includes nor available. Available in size: Toddler height 35"-39" and waist 22"-24". Air Force Fighter Pilot Toddler Earn your wings!! Let your child's imagination soar as the Air Force Fighter Pilot this Halloween. Includes an authentic flight suit with zippers, pockets, patches, and cap. Shoes not included. Available in size: Toddler. Lil' Pirate Cutie Child Arrr! Your little land lubber will be adorable in our Lil' Pirate Cutie costume. Whether you're looking for ancient treasure or doing battle with rival pirates, you'll look the part in our darling Lil' Pirate Cutie costume. Includes white, black, and red dress with fringe trim on the front of the skirt, red and black headpiece with crossbones and gold trim, black belt with gold trim. Skull and crossbones emblem is repeated throughout the costume. Available in Toddler size 2T-4T and Child size Small (4-6). Shoes and tights not inclued..
Sailorette Toddler Take to the high seas with this adorable Sailorette costume! This adorable Sailorette is the perfect toddler costume for any occasion. Includes skirt, shirt, collar, and sailor hat. 100% Polyester. Tights and shoes not included. Available in Toddler sizes 2T and 3T-4T. Airline Pilot Child Cruise at high altitude as an Airline Pilot. "This is your captain speaking. Please fasten your seatbelts and prepare to have an awesome Halloween!" Our Airline Pilot child costume includes dark blue jacket with gold colored stripes at the wrist, gold colored buttons and a captain's wings emblem on the chest, matching pants, white shirt front, black tie, and dark blue captain's hat with gold colored trim and a captain's wings emblem. Available in Toddler size 2T-4T and Child sizes Small (4-6) and Medium (8-10). Shoes not included. A classic rock and roll cutie. The 50's Poodle Cutie costume includes: pink & blue dress with attched crinoline and white lace trim, white belt, and white scarf. Available in Toddler size Medium (2-4). Lil' Poodle Toddler Perfect for your little 50's sweetie! Includes White blouse with attached Pink flannel poodle skirt with Black poodle and Black flannel sweater. This Precious Pirate costume is a little treasure! Costume includes a dress with white long sleeve top, attached pink and black stripe skirt, matching legins, beanie, and black belt. Available in size Toddler 2-4. Sword sold separately. Candy Clown Toddler Jolly little jester! Includes polyester dress with attached hoop, ruffled collar, hat and leggings. Available in child size Toddler. Barbie Cowgirl Infant/Toddler There's a new sheriff in town, and it's Barbie! This adorable pink & white cowgirl dress is made of a huggably soft fabric with an attached vest. Available in child sizes: Infant (size 1-2) and Toddler (size 2-4). This is an officially licensed Barbie™ costume. Giggle while you wiggle! This adorable hula costume includes a print top and pants trimmed with green plastic raffia, floral neckpiece, and two floral arm bands. Available in sizes Infant and Toddler. Sandals not included. Patriotic Cheerleader (Red) Toddler Isn't she so cute! Includes: Red dress with Red, White & Blue detailing and one pom pom. One-size 2-4. G.I. Fatigue Toddler Reporting for duty, sir! Be ready for action in this toddler G.I. costume. Includes camouflage jumpsuit with front buttons, belt and matching hat. Available in toddler size 2-4T. Boots not included. Pink Rose Ballerina Toddler Costume Includes: Leotard with attached tutu and slippers. Hair ties not included. This matey's ready for an adventure. 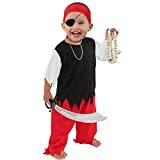 Pirate Boy costume includes shirt, pants and headband made of 100% polyester. Belt with skull and crossbones is also included. Sword and earring sold separately.